" A Westmoreland wood in daffodil time - it was nothing more and nothing less. But to this child with the young passion in her blood, it was a dream, an ecstasy. The golden flowers, the slim stalks, rose from a mist of greenish-blue, made by their speary leaf amid the encircling browns and purples, the intricate stem and branch-work of the still winter-bound hazels. never were daffodils in such a wealth before. 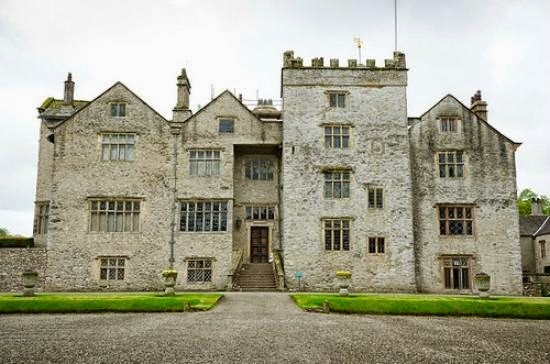 They were flung on the fell-side through a score of acres, in sheets and tapestries of gold....."
Levens Hall which she rented while writing Helbeck was the inspiration for Bannisdale. "It was built of grey stone, covered with a rough-cast, so tempered by age to the colour and surface of the stone, that the many patches where it had dropped away produced hardly any disfiguring effect. The rugged pele tower, origin and source of all the rest, was now grouped with the gables and projections, the broad casemented windows, and deep doorways of a Tudor manor-house." Bannisdale is the home of the Helbecks, one of the northern Roman Catholic families that for centuries stayed true to their faith . For Alan Helbeck it is a struggle to keep the house and estate solvent and the interior of his home has slowly become a shadow of its former self as he sells more and more of the family possessions. He takes his responsibilities seriously but knows if it hadn't been for Bannisdale he would have become a Jesuit priest. Alan has a sister, Augustina, who he has not seen for seventeen years. She married out of the faith and he refused to have anything more to do with her. 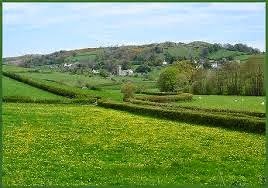 Now she is widowed and returning to Bannisdale to live with her brother, accompanied by her stepdaughter, Laura. Laura's father was an atheist and he raised his motherless daughter according to his beliefs, emphasising freedom for the self without any controlling forces. Alone and grieving in a strange household she is appalled by daily prayers, the chapel, the visiting nuns - the routine of a Catholic family. She turns to her father's farming relatives who live nearby but only finds an equally fanatical Protestant home. Despite their differences Alan and Laura are drawn to each other and fall in love. Laura is unable to reconcile herself to living under the conditions his faith would impose on her and leaves to stay with friends in Oxford but is forced to return when Augustina is dying. It is a story of a relationship between two people with completely opposing religious beliefs. Mary Ward's family circumstances gave her an inside view of the conflict and resulting unhappiness of such a situation and has tried to give a balanced account but it is impossible not to feel more for Laura who is expected to give up everything. If it gets a little melodramatic now and then it's forgiveable and overall I found it powerful and moving. The ending was a bit disturbing and I don't fully understand Laura's actions - I thought she had other choices - will maybe have to reread the final chapters. It is a tragedy and I cried! What more can I ask for. Mary Augusta Arnold was born in 1851 in Hobart, Tasmania, the daughter of Thomas and Julia Arnold. * Her grandfather was the Dr Arnold of Rugby School renown. * Matthew Arnold the poet was her uncle. 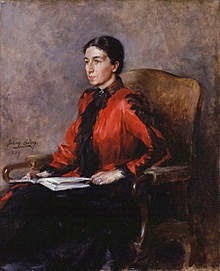 *Her sister Julia married biographer Leonard Huxley and was the mother of Julian and Aldous Huxley. Thomas Arnold, a Professor of Literature, was appointed inspector of schools in Tasmania in 1850. In 1856 he converted to Roman Catholicism with the result he lost his job and the family returned to England. He later reconverted back to Anglicanism and then again back to being a Catholic. It did not make for a happy childhood and the affects can be seen in her writing. Mary Ward was an interesting woman who achieved more than being a novelist and probably deserves to be remembered more than she seems to be today. Thanks for discovering this book; it sounds interesting. I'm putting it on my list. Wow, you are tearing through your Reading England challenge. I'm so impressed! I've made it my main focus for the year and because I'm loving it have no desire for anything else much. I do like discovering new authors and was quite surprised to find Mrs W belonged to such a renowned family.